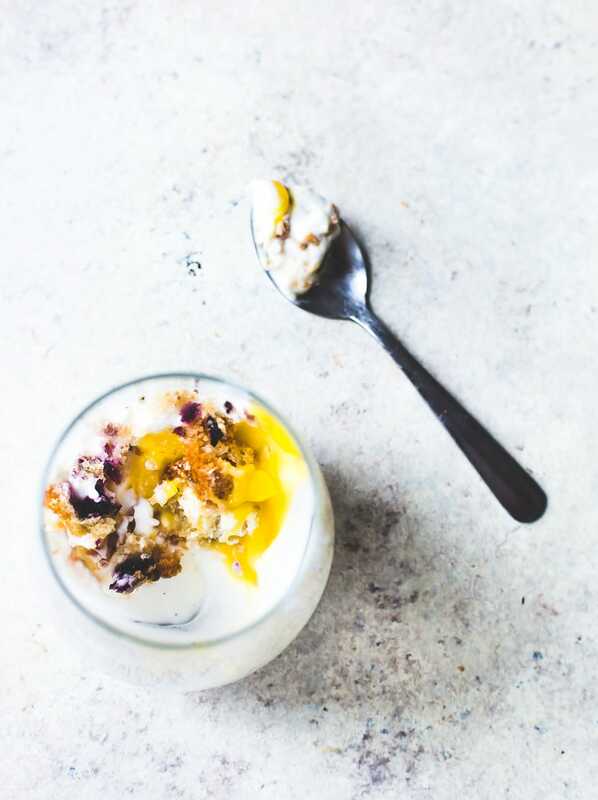 This recipe is in collaboration with Udi’s Gluten Free, a year long partner of Heartbeet Kitchen. ● Cupcake: a small cake baked in a cup-shaped container and typically iced. 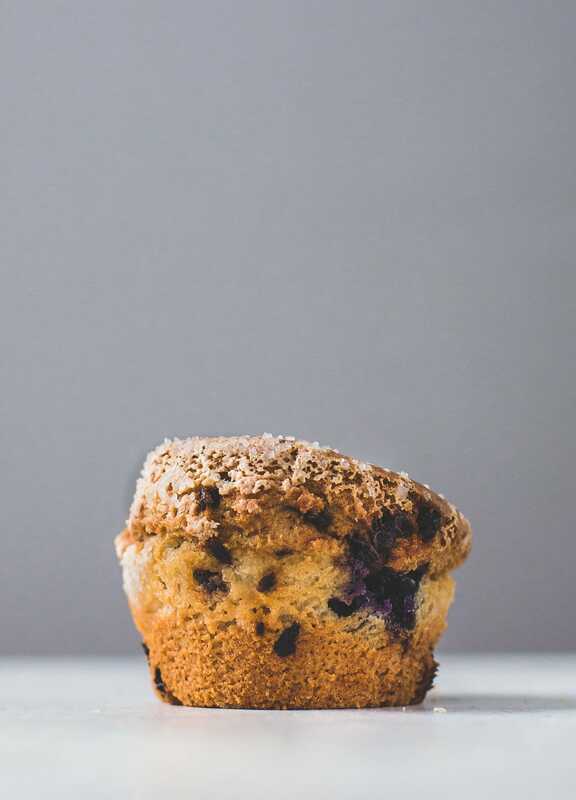 ● Muffin: a small domed cake or quick bread made from batter or dough. Living as a house of two, it seems there are always one or two stragglers left behind from a batch of anything I make. And kind of like root to stem cooking, I like to find creative ways of repurposing baked goods (see: PB Compost Cookies) rather than tossing. Of course you could freeze, but admittedly, a lot of things I put in the icebox are forgotten. So instead, we’re tearing and layering…. 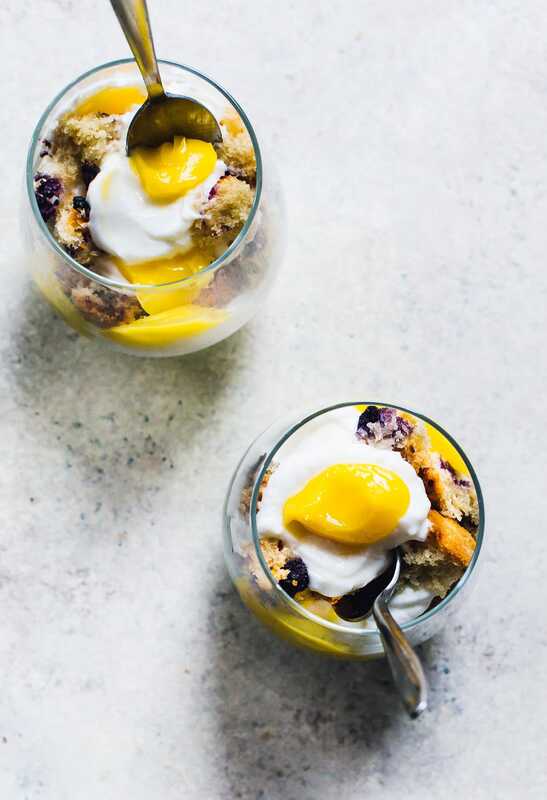 making these Blueberry Muffin Mini Trifles with creamy greek yogurt and tart lemon curd. I’m a big fan of contrasting textures in the food I eat, and believe that either salt or tang is the perfect way to elevate something sweet. And secret’s out. I’m not ashamed to say this recipe is comprised of 3 things you can buy in the store, then assemble on the fly. 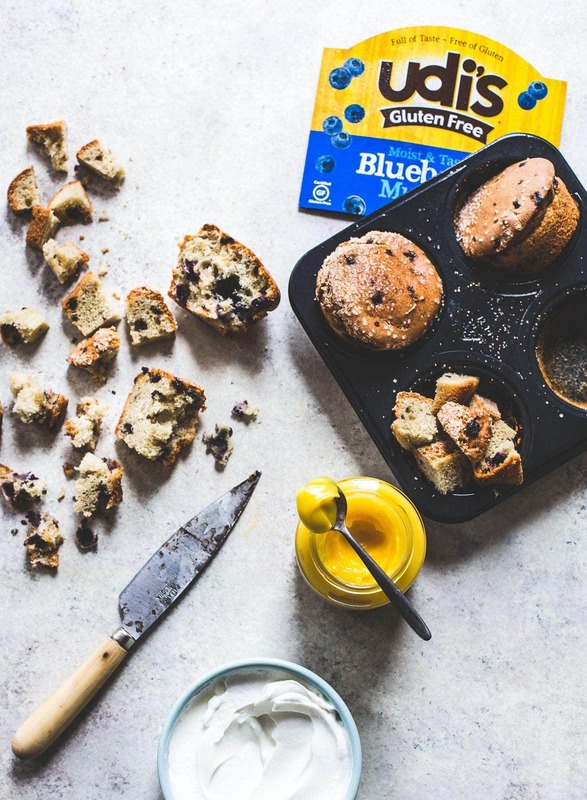 Udi’s Gluten Free Blueberry Muffins, a jar of lemon curd, and greek yogurt. 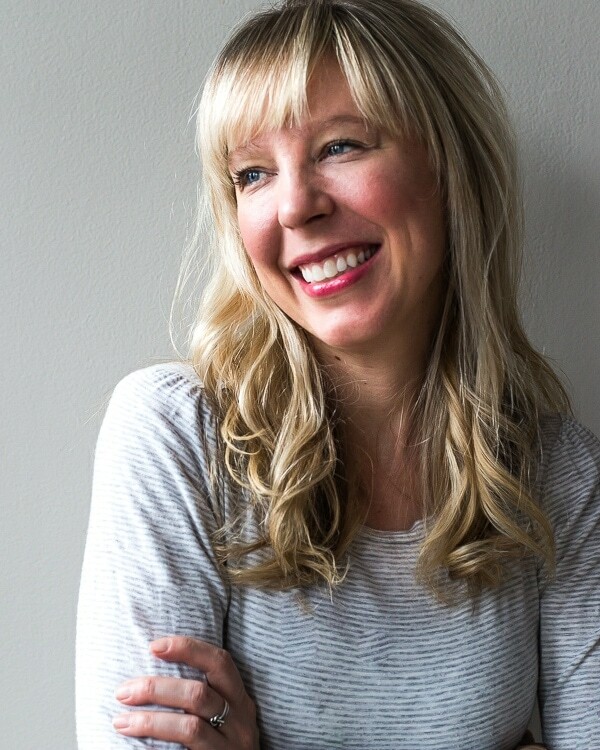 Because I’m a real person too…. Who doesn’t always make things from scratch. Who sometimes thinks about how much it would cost her in groceries and time, to make something like lemon curd – and decides a $7 jar of it is money well spent. Who sometimes just wants something quick, yet tastes like it came from a fancy bakery. Trifles can be made up to six hours in advance. 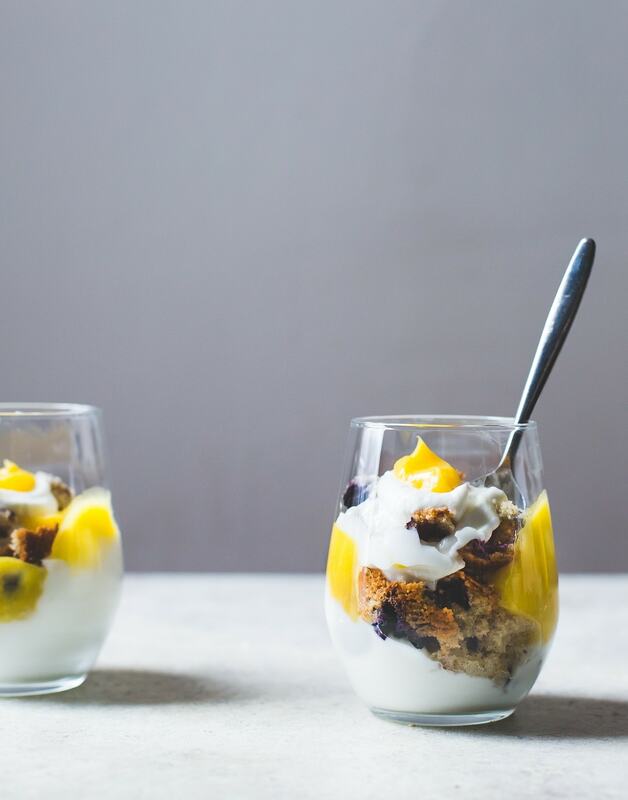 For each trifle, place a ¼ cup layer of greek yogurt on the bottom of the glass. Spoon a tablespoon of lemon curd atop that, then a few small pieces of muffin. Repeat until glass is a little over half full. Store in refrigerator if not eating immediately. *This post contains amazon affiliate links that I may make a small commission from if you decide to purchase. Yum!! 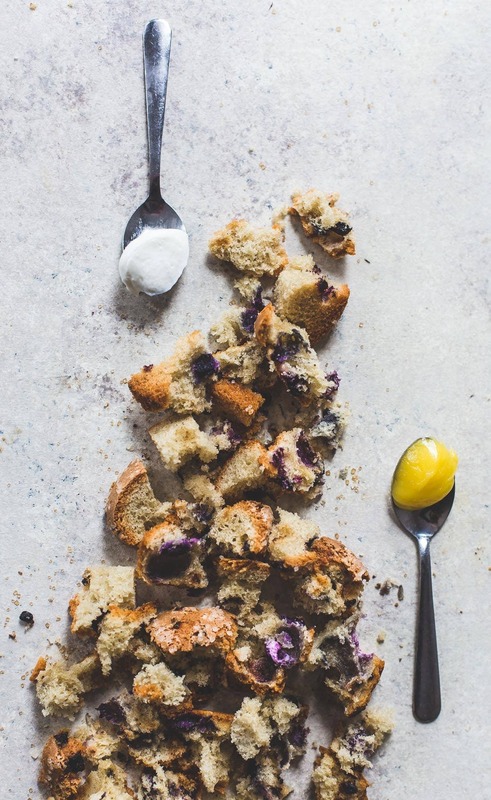 Thanks for always posting such inventive gluten-free recipes!! 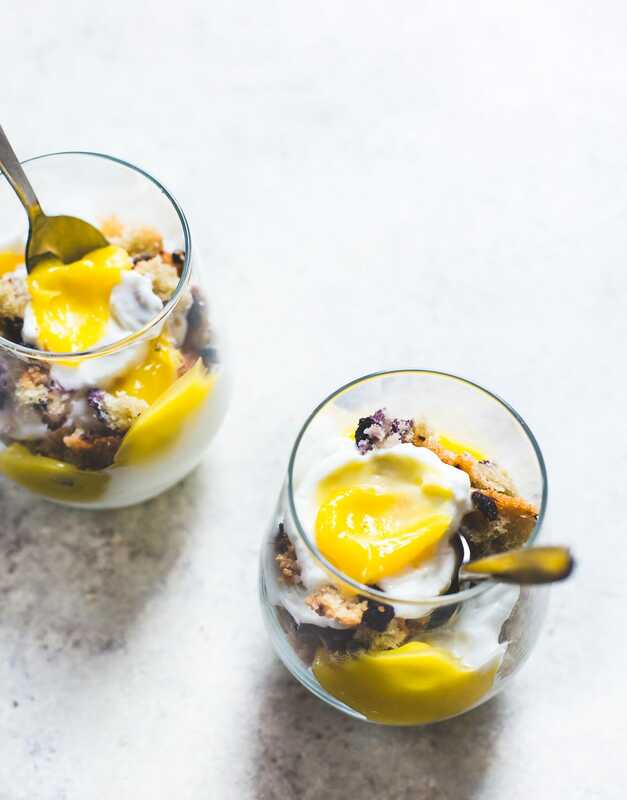 I have a jar of lemon curd in the fridge that I need to use and this sounds like a perfect Saturday breakfast! of course, Elizabeth! so fun that we’ve stayed in touch via FB and the blog. all the love, xo. These look so, so delicious! I love the idea! thanks Tori! something about blueberry and lemon together that i love so much. What an awesome way to use the muffins!! I LOVE it so, so much. That pop of color from the lemon curd is gorgeous, too!! 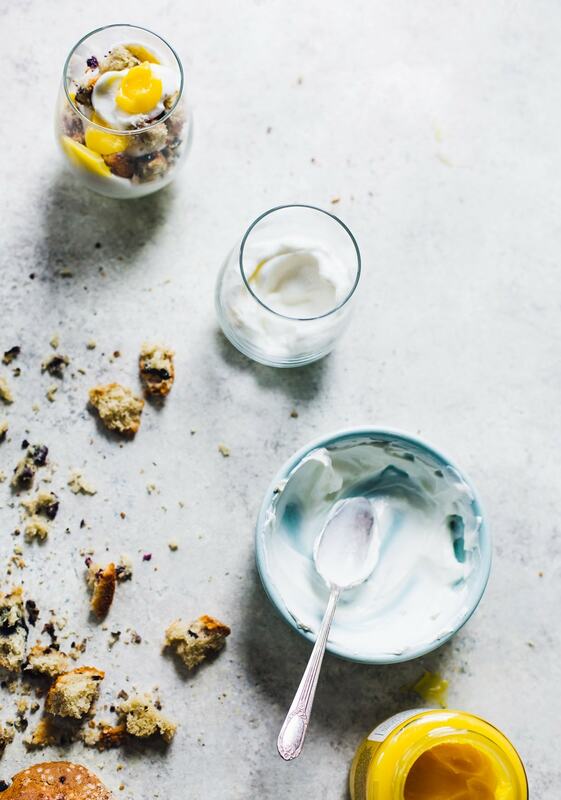 Where to get Lemon Curd or how to make it? You can find lemon curd at regular grocery stores, usually find by the jams and jellies!